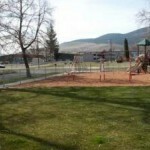 Candy Cane Park is located in Union county, La Grande, Oregon, and is also known as Hatchet Park. If you were driving down “J” Street, Candy Cane Park would be to the South. 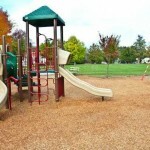 Candy Cane Park has a small playground, a ballfield, half a basketball court, picnic tables, and benches. Many years ago in 1983, a woman named Dana was killed in Candy Cane Park. She was found lying in the grass, still alive, but barely there. Someone had tried to chop off her head with a hatchet. The murder weapon, a hatchet, was found in the bushes behind someones house in La Grande when a boy was mowing the lawn. This woman had been a waitress in a bar. This woman was said to haunt the merry-go-round when it was still there. People say that this woman pushed people off the merry-go-round, and made it spin uncontrollably. The merry-go-round was removed in 2003, so now this ghostly woman is supposed to haunt the park’s benches. She also haunts the parks swing sets. 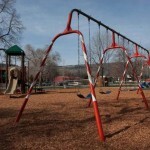 People have reports of seeing a ghostly woman sitting on Candy Cane Park’s benches and swing sets.